Saving lives where road meets rail | News & Media | CTC, Inc.
CTC, Inc. and its innovative, solar-powered passive warning devices are featured in Bruce E. Kelly’s Railwayage.com article “Saving lives where road meets rail.” The following is pulled from his May 21, 2018 article. Whether it’s a failure of today’s driver education classes and state licensing agencies to adequately inform motorists of the meaning of a stop sign or “crossbuck” at railroad crossings, or the modern epidemic of drivers distracted by their own hand-held devices, anything short of gates and flashers seems to leave the door wide open for disaster. The X-shaped crossbuck, a familiar sight throughout rural and even industrial North America, and used in varying sizes and shapes around much of the world, is intended to enforce the same level of traffic control as a yield sign. But many people today, even those who live and work in rail-served communities or who commute to work daily by train, are somehow oblivious to the presence of tracks and trains the moment they sit behind a steering wheel. So-called “passive” crossings, where no electronic warning devices are present, are statistically more dangerous than “active” crossings that have gates and/or flashers. According to a May 2017 report issued jointly by the U.S. DOT and the FRA, crossings protected only by stop signs or crossbucks have more than five times the accident rate crossings with gates, while crossings with no protection devices have 27 times the accident rate those with gates. Those rates were determined by a “per car and per train” analysis of the more than 211,000 crossings in the FRA database. Enhancement of passive warning devices, making them more attention-getting to approaching motorists, has been an ongoing process. One of the earliest examples, which is still in use, is something called the “Ida-Shield,” also referred to as a “Conrail Shield” in some road sign catalogs. It’s an aluminum panel coated with highly-reflective chevron stripes (typically red and silver), attached to the main post supporting a stop sign or crossbuck. The left and right sides of the panel are bent backwards at a 45-degree angle so as to reflect the headlights of an approaching train toward the line of sight of approaching motorists. A three-year study following the first installations of the Ida-Shield in Idaho in the mid-1990s found that the driver compliance rate at passive crossings increased from 44. % to 69.6%, and driver reaction rate (slowing down, turning heads to look for an approaching train) increased from 55.6% to 88.2%. Data gathered in 2008 showed driver compliance was 83% at crossings with both stop signs and Ida-Shields, vs. 52% at crossings with stop signs only. The latest products helping to improve driver compliance at passive crossings are electronically-enhanced signs such as the SignAlert product line from TraffiCalm Systems of Post Falls, Idaho, and E-Signs from CTC, Inc. of Fort Worth, Tex. 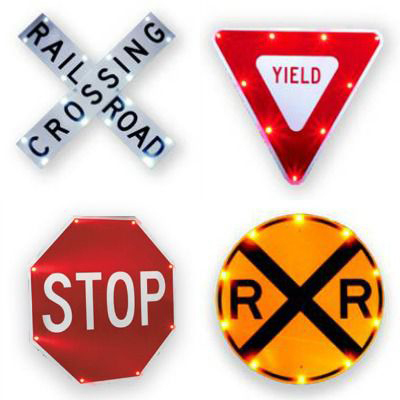 These include stop, yield, and other roadway signs (CTC, Inc. also offers crossbucks) fitted with flashing, high-intensity LEDs along their edges. Optional solar power makes them relatively easy and inexpensive to install at even the most remote locations, and they can be configured to flash continuously or be triggered by motion sensor. Both TraffiCalm and CTC, Inc. say their solar power systems provide up to two weeks of continuous service off a single charge, and batteries will continue to charge under most cloud-cover conditions.